At a recent Tech Startup commission in 2011 for Mint Digital, a now rising architect by the name of Jonathan Steiner along with his staff presented a new cyber platform for sharing and applying the (digital) construction of office furniture such desks and other wood furniture globally. In doing so, Steiner’s objective was to minimize costs, maximize open source availability for architects alike worldwide to submit blueprints, and provide local shopkeepers and woodworking enthusiasts alike the opportunity to create their own desks (think: office, at-home, computer, and even dinner table) all for a fraction of the cost. Based out of London, Steiner and his staff, along with help from his New York office, designed an interface that allowed the sharing of woodwork blueprints through dwg and dxf file format. The blueprint is uploaded, then downloaded (purchased) by customers and wood-workers and businesses to create most commonly through a CNC (computerized numerical control) machine. A CNC machine is used to cut industrial sized metal or in this case wood (specifically plywood) through metrical definitions and a mathematical axis—typically starting at around $10,000.00 USD each. OpenDesk allows it’s consumers to download the information from home, and if handy enough, have the ability to create their own desks for not only less of a price, but also with their own trusted materials and on their own time. So far OpenDesk has over 12,000 downloads, with over 400 designs of office furniture by reputable makers—also classified at this time as a non-profit. Steiner is big on preserving and protecting the environment and through filtration processes approves dependable and appropriate (environmentally friendly) materials to be structured with each blueprint. Steiner’s company currently has a Greenpeace mission in London and strives to maintain a ‘green’ style in his business platform and prospective open-source produts. Building furniture this way, specifically with plywood, allows for a ‘cleaner’ build and the skipping of commonly unsafe chemicals, such as paints with dangerous additives. This form of building also allows builders and the consumers to benefit from using more sturdy material, and justifying their purchase price while customizing what sort of materials are used in their ‘creation’. Steiner says his business is profitable while being practical, giving each associated party a reason share of each creation or project by issuing between 8 and 10 percent to designers, while his business, Opendesk, up to 20 percent of cost. The remaining funds and profit go to the fabricator, whom is also responsible to pay for the materials and construct the table or piece. 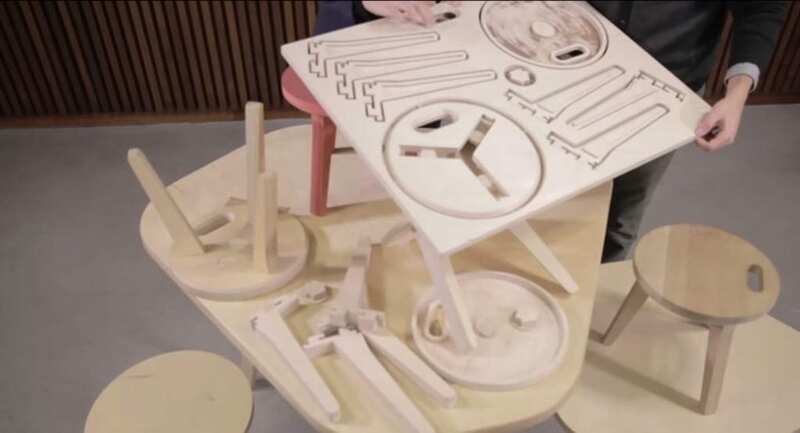 Like 3-D printing machines, there is great potential in OpenDesk and this presents a big threat to famous furniture companies like Ikea for example. This however allows both builders and consumers the ability to be more creative, customizing their furniture. It also decreases the amount of time it takes to receive and create (often custom) office furniture such as wooden desks and chairs in the future as the information is shared digitally. As opposed to typically taking between 6-8 weeks, creating such furniture has now been cut down to a mere 2-3 weeks maximum—thank you Technology! Previous PostPrevious Space Furniture – the Future?